MIGRAINE Epidemiology Migraine headaches are common, with onset usually in the early teens or even younger. Prevalence is estimated at approximately 5 percent for males and 15 to 17 percent for females.2 Prevalence peaks in both sexes at around 40 years of age and then gradually declines. Pathophysiology Early theories postulated abnormal vasculature as the root cause of migraine headaches, with vasoconstriction being responsible for the aura and rebound vasodilatation the cause of the pounding headache. It now seems clear that migraines are a primary response of brain tissue to some trigger, while the disordered activity of blood vessels is secondary. Pain-sensitive intracranial structures, such as blood vessels and the dural matter, are largely supplied by sensory axons of the trigeminal ganglion in the supratentorium, while the upper cervical roots innervate the posterior fossa. Animal models suggest that the headache of migraine is related to activation of these sensory axons, leading to the release of various peptides. This causes sterile neurogenic inflammation in pain-sensitive arteries, the dura, and meningial tissues, and promotes local vasodilatation. The release of these peptides and the resulting inflammation and plasma extravasation can be blocked by sumatriptan, a selective agonist of 5-HT1D (serotonin) receptors, as well as by ergots, indomethacin, and others. Sumatriptan also has direct vasoconstricting effects. Both mechanisms may explain its efficacy at revealing migraine headache. The neurophysiologic pathways linking auras and headaches are still poorly understood. Clinical Features Migraine without aura accounts for about 80 percent of migraines. 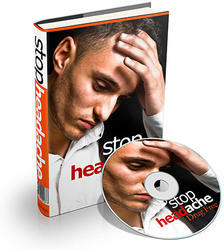 The headache generally is slow in onset and lasts from 4 to 72 h. It is typically unilateral and pulsating, and worsened by physical activity. Nausea, vomiting, and photo- or phonophobia frequently accompany the headache. 3 The scalp may or may not be tender. These features, however, are not entirely sensitive (migraines need not be unilateral or pulsating) or specific (the same features can be present in tension-type headaches).7 Suspicion should be raised when a patient presents with a "migraine" that is significantly different from prior headaches. The headache in migraine with aura is similar but is preceded or accompanied by an aura that develops gradually over minutes, lasts no more than 60 min, and is fully reversible. Clearly, in a patient who presents with a focal neurologic deficit and headache, migraine of any sort must be a diagnosis of exclusion unless the patient has a clear history of previous similar migraines, including the neurologic deficit, and normal results of prior investigations. Given that they rarely last more than 60 min, the aura and deficits would be expected to resolve in migraine patients prior to discharge from the ED. Physicians choosing a medication should consider several factors besides efficacy in relieving headache in the ED, including the ability to abort migraine (i.e., prevent recurrence after relief of symptoms), contraindications, relief of other symptoms, side effects, cost, ease of administration, and time to return to normal activities. Patients should also be asked about their previous experience with a drug and whether they are willing to accept the same treatment again. Unfortunately, many migraine studies do not adequately assess these outcomes and suffer from other limitations.